The XA-232 makes it possible to use Mamiya 645 Pro Lenses in combination with the X2-PRO system. 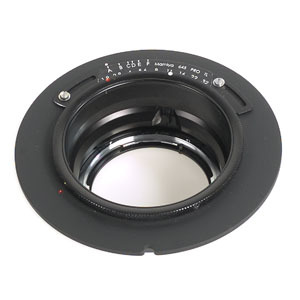 Mamiya 645 Pro lenses can be set manually to the desired aperture setting in the contrary of Mamiya 645 AFd lenses. The XA-232 can only be used in combination with Canon bayonet based SLR bodies and will not work with Nikon bayonet based SLR bodies.